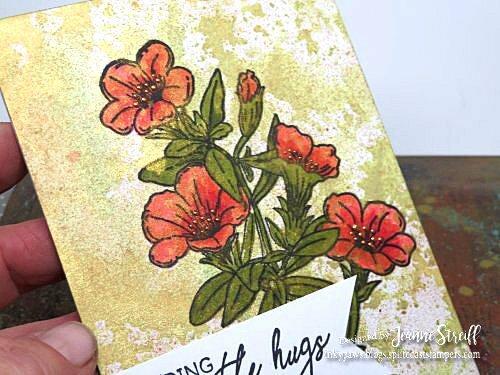 Head on over to the Impression Obsession blog to see all the challenge samples from the design team and to enter the challenge (all the details are there!). 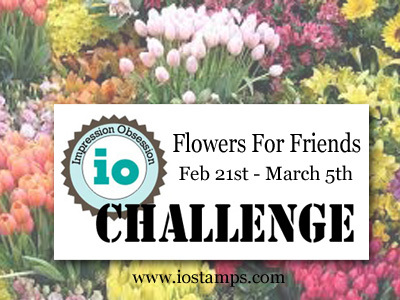 A random challenge project will be selected to showcase on the IO blog AND you can to enter to win a $25 gift certificate from IO just by playing! 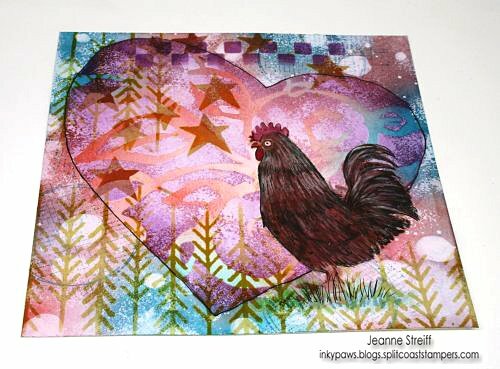 I made a shimmery background by sprinkling a little Lemon Yellow Color Burst onto a craft sheet and spraying Gold Shimmering Bliss spray to activate the pigments. I smooshed my paper onto the wet paint. 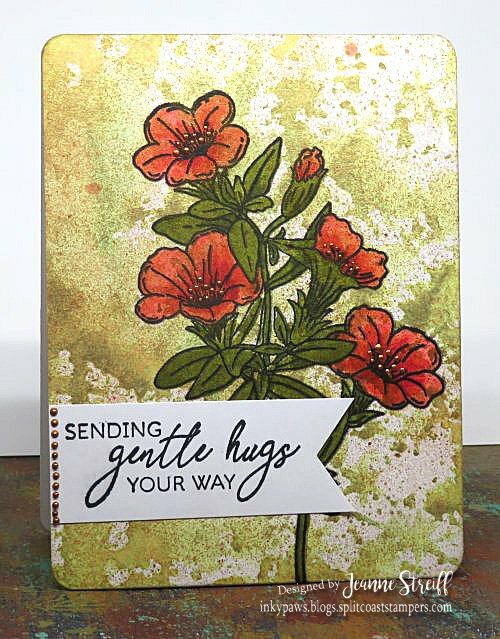 After the background was completely dry I stamped Petunia Sprig with Black IO Ink with my MISTI and colored with Arteza Real Brush Pens. 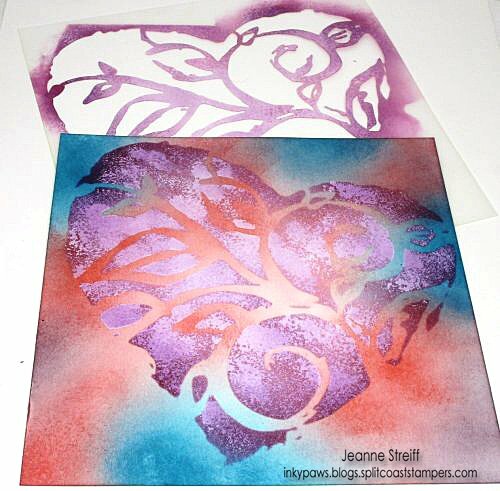 The Impression Obsession and StencilGirl Products Teams are hopping together this week! 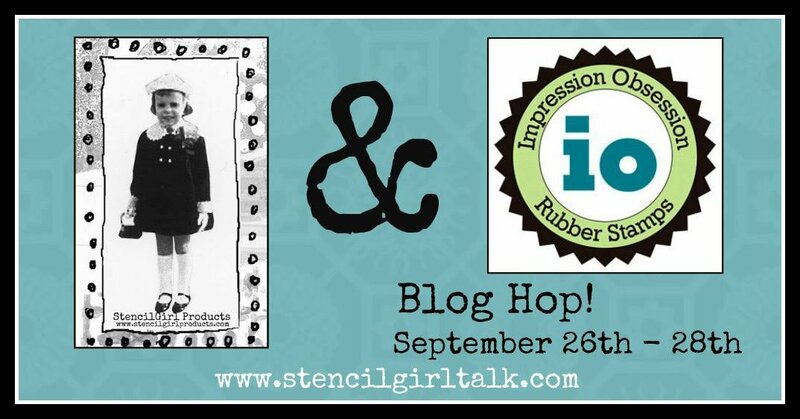 StencilGirl Products will be giving away a $25 Gift Certificate to TWO lucky winners and Impression Obsession will be giving away a $25 Gift Certificate to TWO lucky winners! Visit the fabulous designers from both teams and comment for your chance to win 4 great prizes during the hop! 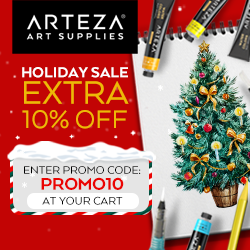 The more blogs you comment on, the more chances you have to WIN! (One comment per blog please.) You have until Friday, September 30th at 11:59PM Central Time to leave your comments. Winners will be announced on StencilGirl’s Facebook page on Sunday, October 2nd. I just had to use the rooster from On The Farm for my project! I sponged a background (Broken China, Candied Apple, and Seedless Preserves) and then used the Heart Swirl stencil over the top with white acrylic paint and Seedless Preserves ink. Next I cut a quick masked and splattered some thinned white paint and then stamped the Grid stamp from 3171-LG Ringtones with Broken China ink. Eeek! Rooster! I love him! 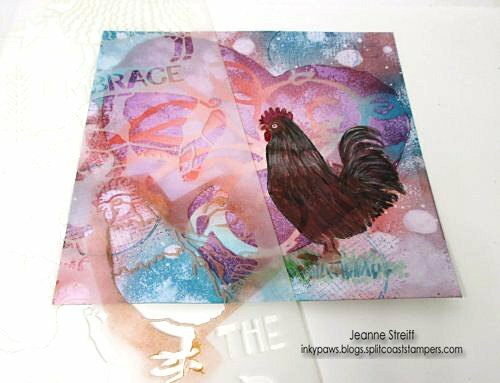 I sponged the cute rooster from On The Farm and then used it as a guide to paint my rooster with watercolors. 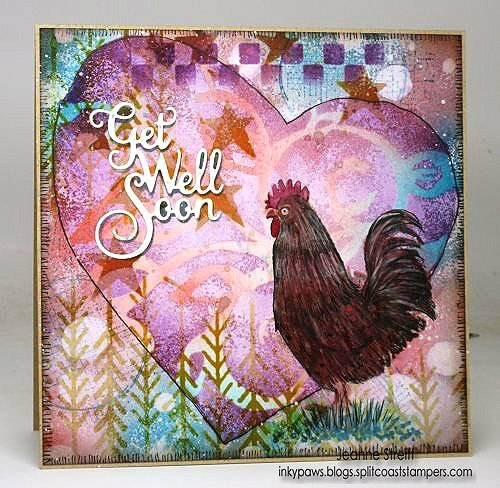 I finished with sponging in some of the extra elements from On The Farm and the I added my DIE382-D Get Well Soon die cut. Jeanne Streiff <– You are here! 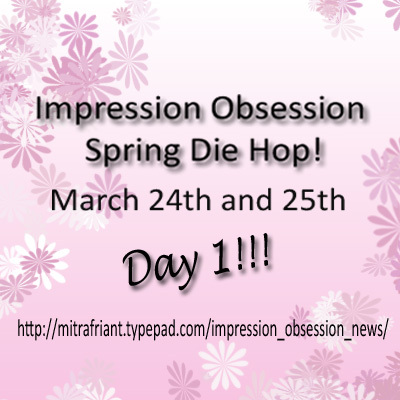 Impression Obsession Spring Blog Hop! 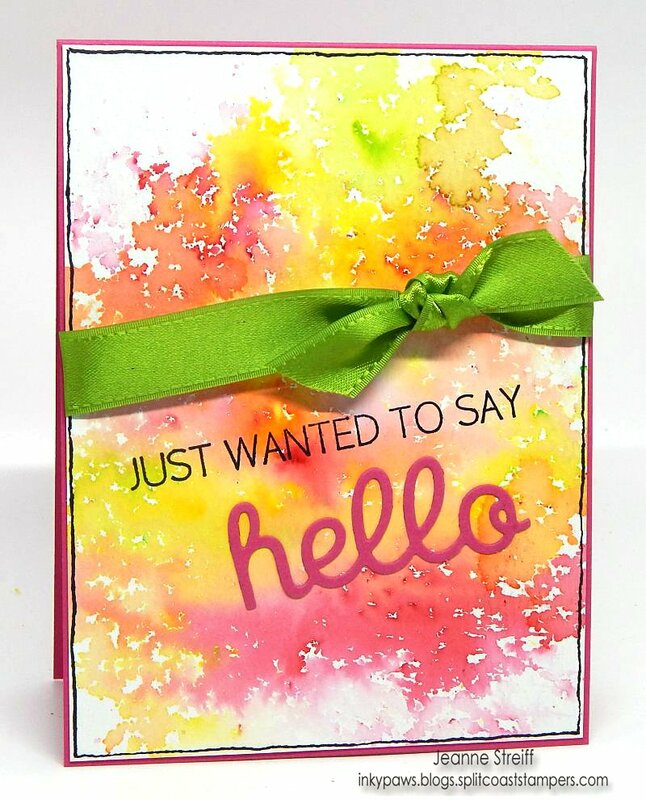 Welcome to the Impression Obsession Spring Die Blog Hop! We have some beautiful projects to share AND PRIZES to give away! The hop will run for 2 days (3/24/16 – 3/25/16) with a list of participants on the Impression Obsession Blogs each day. 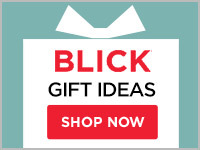 Visit the fabulous Design Team Blogs on the list below (only one comment per blog per day please) for a chance to a Impression Obsession Gift Certificate! Comment entries will be open until 9pm EST on Sunday March 27th and all winners will be announced Monday March 28th on the Impression Obsession Blogs. 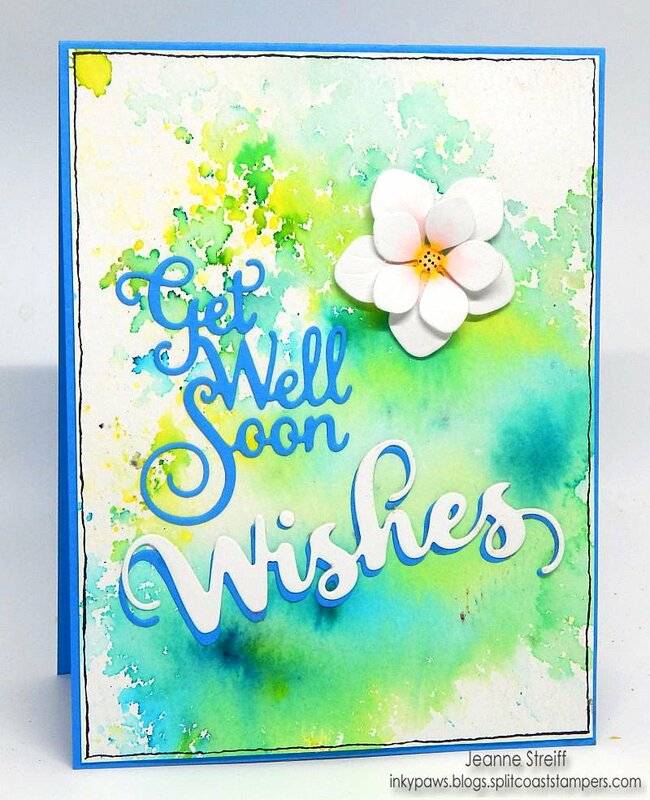 My first card uses DIE376-B Hello and MC663 Hello Clear Set. 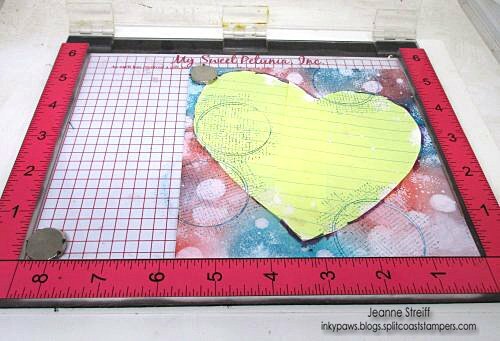 I used Color Burst (Lemon Yellow, Tangerine, Alizarin Crimson and just a touch of Chartreuse )on the Ken Oliver Crafts Best Ever Craft Mat and Stick It adhesive for my die cut from Ken Oliver Crafts.